The leadership of the Russian defense ministry met at an expanded session on December 11, 2015 and Minister Sergei Shoigu said that "two multipurpose submarines and eight warships were delivered to the Navy." However the Russian fleet received only two warships last year. They are small missile ships Zeleny Dol and Serpukhov of project 21631 Buyan-M. Military expert Alexander Mozgovoi believes three new auxiliary vessels were included: oceanographic research Yantar ship of project 22010, armament store carrier Academician Korolev of project 20180TB (20181) and rescue vessel Igor Belousov of project 21130, as well as big dry-cargo ship Yauza which completed seven-year long maintenance and modernization. However, they make six vessels all in all, not eight, the expert said. Project 21631 Buyan-M-class small missile ship (corvette) Zelyony Dol is one of the few surface vessels delivered last year to the Russian Navy. On March 11 the Russian National Defense Center held a day of military production acceptance. President Vladimir Putin mentioned in his opening speech only two submarines out of all naval hardware supplied to the Russian armed forces in 2015. They are diesel-electric Stary Oskol and Krasnodar submarines of project 636.5 which the Navy truly received. Deputy Defense Minister Yuri Borisov cited different figures at the same event. He said the Navy received four warships, four submarines and 52 auxiliary vessels. The differences are most likely due to imperfect accounting in the defense ministry, military experts believe. For example, in 2014 the defense ministry listed Yekaterinburg nuclear submarine of project 667BDRM as a new one although it underwent maintenance and modernization. Thus, it added an old nuclear submarine to three truly new subs to improve the figures of fleet renewal. But it forgot about nuclear submarines Obninsk of project 671RTMK and Tomsk of project 949A which underwent maintenance the same year, as well as Vyborg diesel-electric submarine. In 2015 the defense ministry again listed four submarines which have been allegedly supplied to the Navy. Besides Stary Oskol and Krasnodar, it might have listed multipurpose nuclear subs Gepard of project 971 and Pskov of project 945A which underwent maintenance, as well as Vladikavkaz diesel-electric sub of project 877. In this case there must be five submarines, Mozgovoi said. As for warships, it is difficult to say how two more vessels originated. Last year the Russian Navy received also cargo ships Dvinitsa-50, Vologda-50, Kyzyl-50 bought from Turkish ship owners, as well as Kazan-60, a former Ukrainian vessel received through a Mongolian broker. They all have a long service life and are designated to carry military cargoes from Russian Black Sea ports to the Syrian port of Tartus to provide logistical supplies to the Russian airbase in Hmeymim. Shipbuilders in Sevastopol said former Turkish freighters are in a poor technical state. They have to be repaired before and after every voyage. Some are even towed back home. The Russian Navy received quite a few tugboats, rescue, diving, hydrographic ships, bunkers and floating cranes in the past years. In 2015 there were 20 such vessels. Six warships remained at shipyards or did not complete test trials by the middle of March 2016. They are frigates Admiral Essen of project 11356 and Admiral of the Soviet Fleet Gorshkov of project 22350, corvette Sovershenny of project 20380, large landing ship Ivan Gren of project 11711, coastal minesweeper Alexander Obukhov of project 12700 and combat logistics ship Elbrus of project 23120. 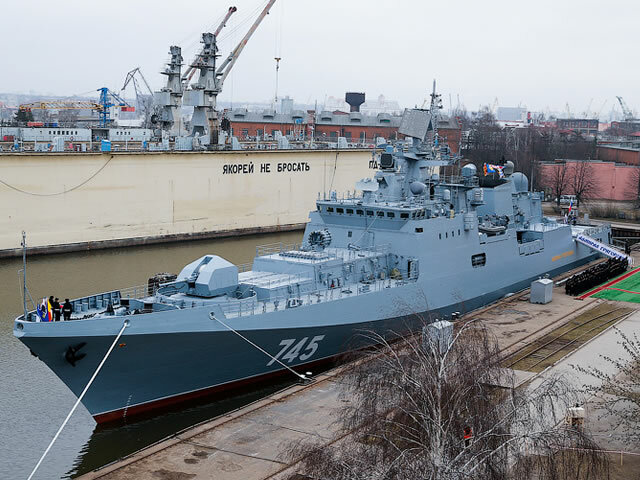 Lead frigate Admiral Grigorovich of project 11356 was handed over to the Navy on March 10, 2016 although initially it had to be delivered yet in 2014. Nuclear submarine Kuzbass of project 971 completed maintenance in the second half of March although it had to be returned to the Pacific fleet before the end of last December. This information contradicts official data, Mozgovoi said. According to Deputy Defense Minister Borisov, besides 6-8 warships the Russian armed forces did not receive from producers 15 aircraft, 17 automatic control systems, three Rokot missile carriers and one Breeze booster, 253 various designation missiles, and 240 pieces of armored hardware and equipment.